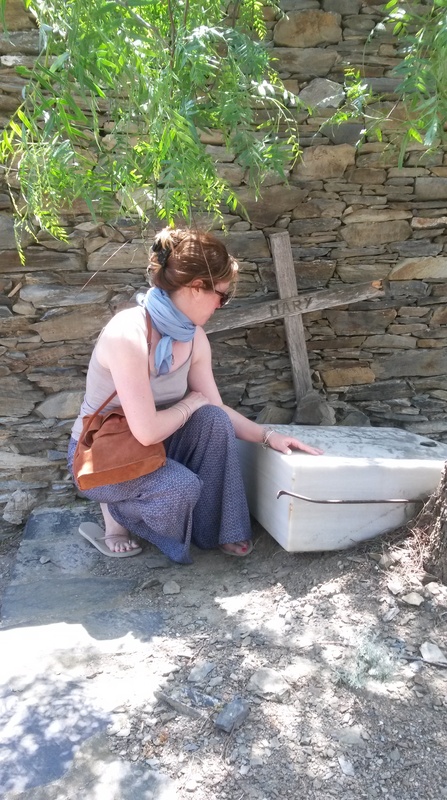 Me at Mary Callery ‘s final resting place. Stone created by Xavier Corbero. Since my husband died I’ve become faintly obsessed with graves, or ‘final resting places’ as they are quaintly known. They provide the last tangible evidence of an earthly existence and as such demand a reverence which is hard to muster in 25 degree Spanish heat without a sun hat. Nevertheless, seeing Mary’s grave was a big moment for me. I know so much about this woman now, having trailed about the world in her footsteps, and the prospect of standing over her cremulated bones filled me with trepidation. The site, high in the scrubland above Cadaques, has no shelter from the Tramuntana, and does indeed seem to be imbued with the ‘seeds of madness’ carried by that savage wind. It is a maze of wall tombs, statues, trees, all set against the raging blue of the sky. A rotting wooden cross marks the spot, propped up behind an immense block of marble, which has been pushed up from the earth by the roots of a mighty weeping bottlebrush. I am pictured above in something of a pious pose, but sit and gaze was all I could do. After two years of seeking her, I finally met my sculpture maker. *consuming crema Catalan and local grog with creative abandon, apparently.